teb-1-big-bus-road-test-in-china, source via - google search, tech news. 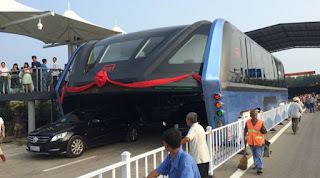 China TEB-1 big bus testing on actual roads, the design is revolutionary as it lets the car drive underneath and can carry up to 1400 passenger on the bus. This will help save road space and also help in reducing pollution. The bus is known as the TEB-1 big bus , a road test of the bus was conducted in Qinhuangdao. The TEB-1 big bus is powered by electricity and is 22 meters long and 7.7 meters wide, there was a special track developed for testing of the bus. The picture shows us cars passing below it, the passenger area of the bus is in the middle and at a very good height. The design of the TEB-1 big bus was released in may this year by a Chinese firm and went viral on the social media and many talked about its viability. This concept is also known as the airbus, Regardless of whether the bus is moving or not, cars under 2 meters high can easily pass through. The top speed of the TEB-1 big bus is 60 km/hr which is said to be good according to its height and passengers weight. "The biggest advantage is that the bus will save lots of road space," Song Youzhou, chief engineer of the straddling bus project told state-run Xinhua news agency in May this year. The manufacturing time of the bus is shorted and also the design is environment-friendly. There is also an opportunity for exports to other countries as well if this test is a success on actual roads. The bus size and passenger capacity can replace up to 40 actual buses now and also can save tonnes of fuel cost required for the same. Many cities in China have shown interest in the concept and many worldwide cities will also soon if this test is a success.